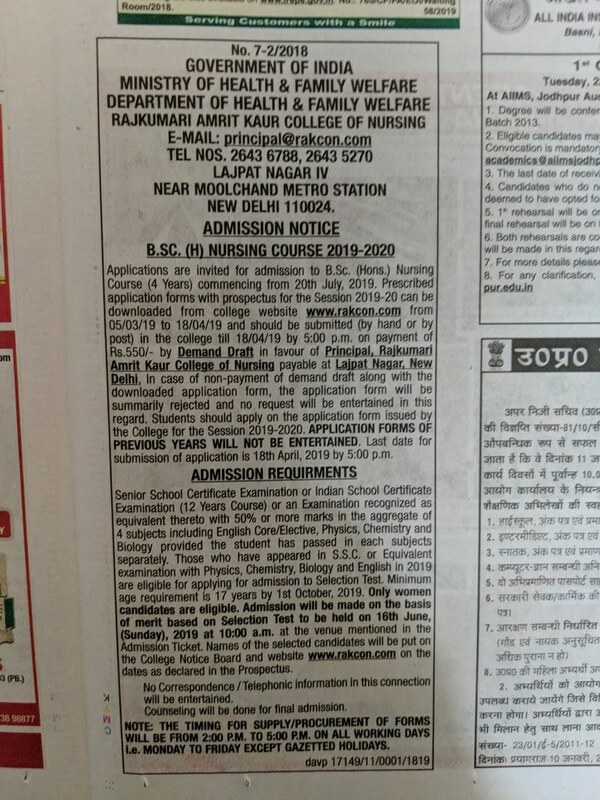 Rajkumari Amrit Kaur College of Nursing (RAKCON) has released the application form for M.Sc. (Nursing) and B.Sc. (Hons.) Nursing also RAKCON has published the information brochure regarding admission in B.Sc (H) Nursing & M.Sc Nursing courses for the academic year 2019-20. The application form is available here, you can download from this page. Candidates are advised to fill their application for Nursing courses on or before the last date. Candidates can check the complete details of the Nursing Courses like application process, eligibility criteria and other information on this page below. Latest: Application Forms for M.Sc. (Nursing) and B.Sc. (Hons.) Nursing has been released. Scroll down to access the link. Those candidates who seek admission in above Nursing courses can fill their application as per the schedule given below at Rajkumari Amrit Kaur College of Nursing. Admit card will be issued to those candidates who have filled their application on time. Admission will be made on the basis of merit based on Selection Test to be held on 16 Jun,2019 for B.Sc (Hons) Nursing course. Qualified candidates in the entrance examination will be called for counselling for final admission. Schedule for RAKCON Nursing Admission 2019 is given below. The given below notification is given here as per News Paper Advertisement. Application form with Prospectus for B.Sc. (H) Nursing for the session 2019-2020 can be downloaded from the college website (www.rakcon.com) and should be submitted with a Demand draft of Rs. 550/- in favour of “Principal Rajkumari Amrit Kaur College of Nursing” payable at Lajpat Nagar, New Delhi. Candidates can download the application form from the given link below. 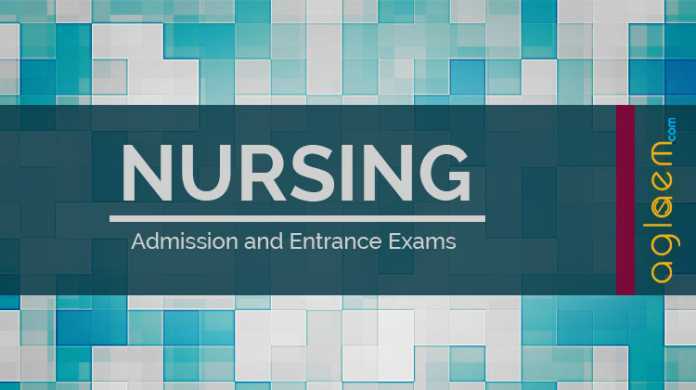 Application form: Click here to download the RAKCON Nursing Admission 2019. Self-attested copy of Secondary (10th) examination certificate indicating the date of birth. Self-attested copy of senior secondary certificate examination(12th) or equivalent mark sheet. Self-attested copy of SSC provisional certificate, if original board/ university copy not received. Self-attested copy of scheduled caste/scheduled tribe/OBC certificate(non-creamy) from a competent authority, if applicable. Foreign students are required to submit a certificate indicating proficiency in the English language. A recent certificate of good conduct from the educational institute last attended or from a gazetted officer. Self-attested copy of marks obtained in B.Sc nursing examination in each subject (if examination are held in parts/semester, marks obtained in each, part semester should be enclosed), a copy of the transcript in this regard will not be entertained. Self-attested copy of B..Sc nursing degree. Self-attested copy of R.N/R.M Certiicate. Three recent passport size photographs attested by the principal of the senior school/college last attended/gazetted officer. The photograph should show the name of the candidate and date when taken. A certificate from sponsoring authority, if applicable. Self-attested copies of experience certificate from competent authority. Self-attested copy of scheduled caste/scheduled tribe/OBC certificate(non-creamy)/ PWD/ Ex-servicemen certificate from competent authority, if applicable. OBC (non-creamy layer) certificate (in the name of the candidate) issued in the same financial year by the competent authority. 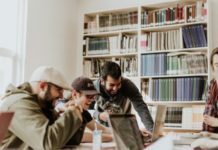 Foreign students are required to submit a certificate indicating proficiency in the English language (verbal as well as written). A candidate seeking admission to Master of Nursing Course must have passed B.Sc. (Hons.) Nursing examination (11+4) years of the University of Delhi or B.Sc. Examination in Nursing (11+4) years of a recognised as equivalent there to with 55% marks in the aggregate and Two years of experience in Nursing in an approved hospital/educational institution or public health agency. 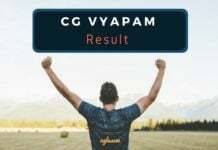 A candidate passed post Basic B.Sc. from recognised centres (from INC) of IGNOU University will be only eligible for this course. Senior Secondary School Certificate Examination/lndian School Certificate Examination (12 years Course) and / or examination recognised as equivalent with 50% or more marks in the aggregate of 4 subjects including English, Physics, Chemistry and Biology provided the student has passed in each subject separately. Only women candidates are eligible for the course. Minimum age requirement is 17 years. The Vice-Chancellor may, however, on the basis of individual merit relax the age up to a maximum period of one year. Admit for RAKCON Nursing for admission in B.Sc (H) Nursing & M.Sc Nursing will be available after the completion of application process. Dates of availability of Admit card has been announced. Candidates who fill their application on before the last date will be eligible and issue admit card by Rajkumari Amrit Kaur College of Nursing. 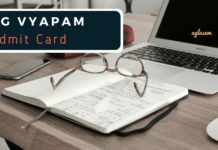 Admit card is very important document which contains name of the candidates, venue of selection test and some other details. Candidates who do not bring their admit card at the time of test will not be allow to enter in the examination hall. Rajkumari Amrit Kaur College Of Nursing (RAKCON) will release the answer key for the M.Sc. & B.Sc(H) entrance exam conducted by them. Candidates can check the answer key from this page when it will be available. The selection of the candidates for admission to B.Sc. (Hons.) Nursing Course will be made on the merit of Selection Test. All candidates, irrespective of reserved or non-reserved category, have to appear for the Selection test except foreign nationals. Selection test will be held on the scheduled date in New Delhi as per the venue indicated in the Admission Ticket. The selection test will be of two hours and thirty minutes (2½ hours) duration and shall contain objective type (multiple choices) questions. The test will be based on Senior Secondary School Certificate (10+2) Curriculum of Physics, Chemistry, Biology and shall also include, some questions on English Comprehension and general knowledge in health. The selection of Candidates for admission to M.Sc. Nursing Course will be made in the following manner. 50% of the seats in the course will be filled in by the candidates who have passed B.Sc. (Hons.) Nursing Examination of the University of Delhi. The criteria for the merit would be weightage of 50% of the selection test and 50% of the qualifying examination. SC/ST candidates who belong to category-1 reserved category status (SC/ST/OBC), one can avail only one benefit either selection under category-1 or from reserved category (SC/ST/OBC). The remaining 50% of seats will be offered to candidates on the basis of the performance in the Selection test and last qualifying examination. The criteria for the merit would be weightage of 50% of the Selection test and 50% of the qualifying examination. Weightage of 5 marks will be given to the candidates who are in the employment of State Government or College ofNursing/ Schools of Nursing and whose names are sponsored by their employer. However, only one candidate (non-reserved) per each State/Union Territory from among the sponsored candidates of that State/Union territory will be eligible for weightage of 5 marks who secures highest in the selection test. The candidate must produce the sponsorship letter. Sponsored candidate receiving 5 marks if selected should submit a relieving letter confirming sponsorship at the time of admission. The candidates belonging to the reserved categories will complete for reserved seats among themselves. A final selection list will be prepared for these categories on the basis of their performance in the selection test. Selection Test will be held on the scheduled date at the centre mentioned in the admission ticket. The test will be of two hours and thirty minutes (2½ hrs) duration and shall contain objective type questions. The test will be based on B.Sc. Nursing Syllabus prescribed by I.N.C. All Candidates are required to report one hour before the commencement of the test. Areas to be included in the Selection Test are Nursing Foundation, Applied Nutrition, Preventive Medicine and epidemiology, Psychology, Sociology, Medical-Surgical Nursing, Obstetrics and Obstetrical Nursing, Paediatric Nursing, Psychiatry Nursing Community Health Nursing and Basic Concepts of Education, Administration, Research and Statistics. The result of B.Sc (H) Nursing & M.Sc Nursing Selection test result will be release after completing the examination by the Rajkumari Amrit Kaur College Of Nursing (RAKCON). Candidates can check the list of candidates selected for admission when it will be available. The admission to the course shall be made purely on the basis of merits obtained in selection test 2019. Counseling will be conducted for the admission to B.Sc. (Hons.) Nursing, M.Sc. Nursing. Entrance result will be displayed on the website www.rakcon.com & notice board of the college. Notification regarding counseling will also be displayed on college notice board & website. Class X Board Examination Certificate. OBC (Non-Creamy Layer) Certificate (in the name of the Candidate) issued by competent authority. Transfer Certificate from school/college as well as Migration Certificate from Board/University are required from those students who have passed senior secondary exam from outside Delhi. Admit card of selection test 2019. Three Passport size photographs as pasted on the application form / Admit card. Candidates seeking admission against reserved seats for Physically Handicapped would be required to bring with them the original Medical Certificate issued to them by an authorized Medical Board. Candidates seeking admission against reserved seats for wards of Ex-Servicemen are required to bring the original certificate issued by the competent authority as per university guidelines. No candidates will be allowed to attend the counseling without original certificates. Note: Copy of self-attested above mentioned document is to be submitted. For more information about Nursing admission 2019 download Prospectus. Kitne ques aate h or negative marking hoti h kya?? Can I submit application form by speed post? Is there any issue about that? On my demand draft, I had put coma after principal , is there any issue?? No there isn’t an issue. The application form is not out yet. What should be the min score in there entrance exam to get admission as a general category in rakcon ? 1.B.Sc. (Hons.) Nursing (12+4 years) of the University of Delhi or B.Sc. Examination in Nursing (12+4 Years) of a recognized university or an examination recognized as equivalent thereto with 55% marks in the aggregate and One year experience in Nursing in an approved hospital/ educational institution or public health agency. 2. A candidate seeking admission to the Master of Nursing Course must have passed B.Sc. (Hons.) Nursing examination (11+4) years of the University of Delhi or B.Sc. Examination in Nursing (11+4) years of a recognized as equivalent thereto with 55% marks in the aggregate and Two years of experience in Nursing in an approved hospital/educational institution or public health agency. 3. A candidate passed post-Basic B.Sc. from recognized centres (from INC) of IGNOU University will be only eligible for this course. The syllabus is class 11-12th physics ,biology and chemistry? If there any topics that we can leave while revising the concepts? Kya Puri 11-12th ki physics , chemistry and biology hi hmara syllabus he? We don’t know what questions might come. so it’s better to complete all.